The Art of Flintknapping involves the production of many types of stone tools above and beyond projectile points and knives. A few of these are replications of actual historical artifacts. Others are imaginative extensions of Paleolithic tool construction. These are the ones currently available. Please directly CONTACT US or use this Special Request Form (pdf) to obtain a quote for the replication of any other stone tool you might be interested in. Dr. "Arizona" loves a challenge. Remember that since these knives are not started until the order is received that there will be a month or more manufacturing delay in filling your order. This is a composite tool which is a replica of the legendary Aztec Obsidian Sword. It is a long (approximately 2 feet) straight piece of wood in which shaped flakes of obsidian have been inserted in a groove down the side. The handle is leather wrapped with a leather wrist loop. Available in two varieties, one with a point on the end (pictured) and the other more traditional type without this point. The blades are not true blades but modified flakes. Expect a month delay in order fulfillment. This arrow is not necessarily made for use but for display. The arrowhead is one of the many that Dr. Arizona creates. The shaft is a straight wood dowel. The fletching is either Turkey or Goose Feathers. The lashings use artifical sinew. This arrow will look great over your mantle. Expect a month delay in order fulfillment. This arrow is a traditionally made arrow that can be used but is specifically made for display. The arrowhead is one of the many that Dr. Arizona creates. The shaft is a traditionally straightened syringa wood. The fletching is either Turkey or Goose Feathers. The lashings use artifical sinew. This arrow will look great over your mantle. Expect a month delay in order fulfillment. This hatchet is not modeled after any particular artifact since an obsidian blade would not stand up to chopping work. However, hatchets with stone axe blades of this configuration have been found. This particular example is made simply for display and as a great conversation piece. 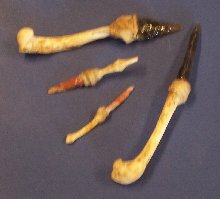 The blade is a percussion worked biface hafted into a bone with leather lashing. Expect a month delay in order fulfillment. This hatchet has a Chipped Flint or Chert Stone Axe Head. The blade is a percussion worked biface hafted into a bone or hard wood handle with leather lashing. Expect a month delay in order fulfillment. This hatchet has a Ground and Polished Stone Axe Head. The Axe Head is hafted into a bone or hard wood handle with leather lashing. This artifact replicates a very traditional variation found world-wide. Expect a two month delay in order fulfillment. 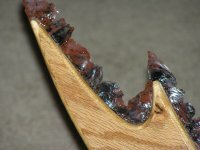 Obsidian Blades Edge the Cutting Interior Side of This 3 1/2 Foot Long Bat'Lith. 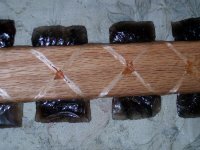 These Blades are Hafted in a Oak Plywood Handle with Clear Epoxy. This is a Unique Artifact from the Klingon Archaeological Project of Phoenix Obsidian Designs. Comes with a Wood and Antler Display Prop, a Carry Bag and a Signed/Numbered Certificate of Authenticity. A very unique and signature Dr. Arizona creation. Expect a two month delay in order fulfillment. This Spear has a long straight wood body with a Large Obsidian Spear Biface Point. The Shaft is decorated with Deerskin, Beads and Feathers. Expect a month delay in order fulfillment. This spear has a lightweight straight wood shaft with a Medium sized point. The far end has a depression for use on an Atlatl. Specifically configured for potential use. Expect a month delay in order fulfillment. Small toy knife with a rodent bone handle. Like the knife you'd expect a cat to make if they had thumbs. Expect a three to four week delay in order fulfillment. This Maul has a Polished Stone Head with a rounded end. 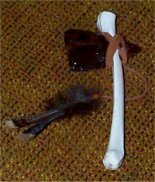 The Maul Head is hafted into a bone or hard wood handle with leather lashing. This artifact replicates a very traditional variation found world-wide. Expect a month delay in order fulfillment.